Let’s get one thing straight at the start: it’s not Minorca we’re talking about, it’s MENORCA. That’s what they call it over there in the Balearic Islands. They have their own language you see. Ah, Catalan, we assumed when told this by Alberto, our knowledgeable guide. He looked at us rather amusedly and explained that no, it’s not Catalan. And, he hastened to add, it’s not Mallorcan either: each island has its own version, close cousins of Catalan, but what they do have in common is that none of them is Spanish. So when you arrive there and see all the signs everywhere declaring MAÓ in capital letters, don’t assume the Chinese have taken over (not yet anyway): this is the Menorcan word for Mahon, which is what the Spanish called the island’s capital until Franco died and the suppression of regional languages ended. The capital used to be Ciutadella (a different city altogether – pay close attention now), but the British, who, among others, took over the island at various times, decided that MAÓ was a more strategic place to have a capital. And you can see why: it has a magnificent natural harbour, sitting in a beautiful bay. The best way to get an appreciation of its location and colourful past is to take a one-hour cruise, as we did, in the big glass-bottomed boats run by the Yellow Catamaran company. As you sun yourself on deck they give a three-language potted history of Port de Maó – pointing out such interesting features as the little pier-end house where Richard Branson comes every summer to unwind, or the old colonial mansion on the hillside where Admiral Nelson dallied with Emma Hamilton en route to the battle of Trafalgar. Keep an eye out for it. Our attention was also drawn to the quarantine island where sick people were confined in the past. Nobody mentioned swine ‘flu. Dubliners will feel quite at home in MAÓ – there are Martello towers all around the harbour (but none with a literary connection). But what of the rest of Menorca? Another thing that soon becomes obvious, apart from the language difference mentioned above, is that it is not Mallorca. The larger Balearic island, along with Ibiza, has acquired a reputation for being a holiday destination offering cheap’n’cheerful package deals and, in Ibiza’s case, resorts where 24-hour hedonism is nigh-on compulsory. 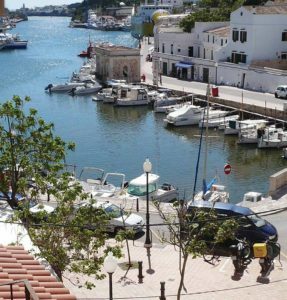 Neither is wholly accurate, as both have their quieter places, too, but Menorca wins out hands down when it comes to tranquil beaches and gorgeous clear-water coves – and no seriously high-rise clutter. This policy has paid off in making it a popular destination for families, who flock to its unspoiled beaches, most of which are sandy and safe, shelving gently into shallow, turquoise waters. Surprisingly green and tree-covered, Menorca is a great place for walking and cycling holidays – and for kayaking and sailing. But to really explore the place it would be well worth hiring a car. The island’s one big main road links Ciutadella in the west with Maó in the east, with minor roads running north and south off this to to get to some of the more remote beaches and dramatic, rocky headlands. Among the outstanding beaches is Cala Santa Galdana on the south coast, where we were billeted in the Hotel Audax (www.rtmhotels.es) which not only has a lovely spa, but also commands a breath-taking view of the horse-shoe shaped cove, overhung with tall pine trees. Uncomfortably, one was conscious that this hotel, along with the much more garish and intrusive Sol Gavilanes Hotel, is part of the inevitable urbanisation resented by some Menorcans – but tourism is a vital part of its economy. More great beaches are to be found in Platjes de Cavalleria, Arenal d’en Castell, Son Bou, Cala en Porter and sundry other places too numerous to mention. Some are undeveloped (unspoilt?) while others have all mod cons. Our excellent guide Alberto (a blow-in many years ago from Galicia) demonstrated an encyclopaedic knowledge of Menorcan history, geology and archaeology as we traversed the highways and byways, and undertook pleasant walking tours of the old streets of MAÓ and Ciutadella. If you ever had to study the War of the Spanish Succession for your exams – and hated it – Alberto would bring it all back: every second building or church seemed to have some link to that contretemps, which he insisted on trying to unravel, repeatedly. One felt like paraphrasing the Monty Python sketch and protesting “We didn’t ask for the War of the Spanish Succession!” But he did bring the island alive to us and took us to some special spots that might escape the casual motorist. One such spot was Naveta Des Tudons, a mysterious prehistoric monument set in the middle of the herb-perfumed countryside, a two-storeyed stone tomb where burials took place over many centuries. A second unusual must-see stop on our island tour was Binibecca Veill Town. This looks for all the world like a Moorish village but was purpose built by an architect in the 1960s (you can rent an apartment there). But possibly the knockout stopping-place on our drive was the astonishing Cova d’en Xoroi – a series of interlinked caves accessed by steep steps clinging to the cliff-face overhanging the sea. But you don’t need to be a speleologist to explore these caves – the place has been turned into a chill-out bar by day, and a cool disco by night. It also affords spectacular views of the Menorcan sunset. The place has a legend attached, about a mysterious stranger who holed up there in the dim and distant past, and nabbed one of the local girls, imprisoning her in the caves. Nobody knew where she was for years until one night it snowed … and his footprints in search of food were his undoing. You wouldn’t get that kind of carry-on in the Ailwee Caves. n KAYAK SCHOOLS: There are many places suitable for kayaking on the island. In Es Grau we found the folk at Menorca En Kayak (www.menorcaenkayak.com) to be very good, and very patient with total beginners who freaked out at the first wobble. n Restaurant Ses Voltes, an atmospheric dining place in old Ciutedella, where the tapas are to die for – and then they hit you with a main course that tops them! n Restaurant Café Balear in Ciutadella Port, a popular spot with families, with great fish and meat specialities.